Looking for the best in luxury living? Dubai is a magical place to live. Now you can experience all Dubai has to offer and own a villa at Majestic Vistas in Dubai Hills. Majestic Vistas is located on the first row of the Dubai Hills golf course. Majestic Vistas consists of a collection of 6-bedroom retreat-style villas with a prime location facing the golf course. The luxury villas are available in four distinct styles – Mulligan, Rowan, Albatross, & Ambrose. Plus, each villa features both modern and Arabesque styles. The homes in Dubai Hills all feature full-height windows. As a result, they offer views of the scenic golf course. Each villa is impressively proportioned. Therefore, they’re richly styled and flooded with natural light. Plus, the villas come with 2 kitchens each. Thus one can be shared with the family and another to entertain your friends. Majestic Vistas is surrounded by immaculate golf course fairways. All of the 44 six bedroom villas are lined by the 18-hole championship golf course at the prestigious Dubai Hills Golf Club. These luxurious villas seamlessly blend both indoor and outdoor. In addition, the homes are richly detailed, unabashedly glamorous and offer redefine modern Arabic splendour. Therefore, the traditional Arabic Mashrabiya provide privacy and temperature control. The end result is intimate, cool luxury. – This collection of villas comes with a total area of 8,217 sq ft. The villas on offer, host 6 bedrooms, a master suite with dressing room, 7 bathrooms, 2 kitchens and formal and family living rooms. It also features a maid’s room, a storage room and a parking garage. – The Mulligan Collection, comes with a total area of 9,145 sq ft. and features 6 bedroom villas, that also come with a master suite, 7 bathrooms, 2 kitchens, formal and family living rooms maid’s room, along with storage room, maid’s room, study and parking garage. – Enjoying a total area of 9,655 sq ft., the Rowan Collection hosts 6 bedroom villas. The homes feature a master suite, 7 bathrooms, 2 kitchens, plus formal and family living rooms. In addition, there is a maid’s room, storage room, study, pantry room and parking garage. – The Albatross Collection has a total area of 10,063 sq ft. and host 6 bedrooms. They also offer a master suite, 7 bathrooms, 2 kitchens, formal and family living rooms, along with a maid’s room, a storage room, a study, a pantry room, a nanny’s room, a driver’s room and a parking garage. There are countless luxury amenities and plenty to do nearby Dubai Hills. For example, facilities in the property’s vicinity include – a golf club academy, tennis court, half basketball court, nature trails, outdoor fitness areas, cycle paths, plus children’s play areas. Pricing for Majestic Vistas villas begin at AED 14,000,000. The scheduled completion date for all 44 villa units is targeted for late 2012. 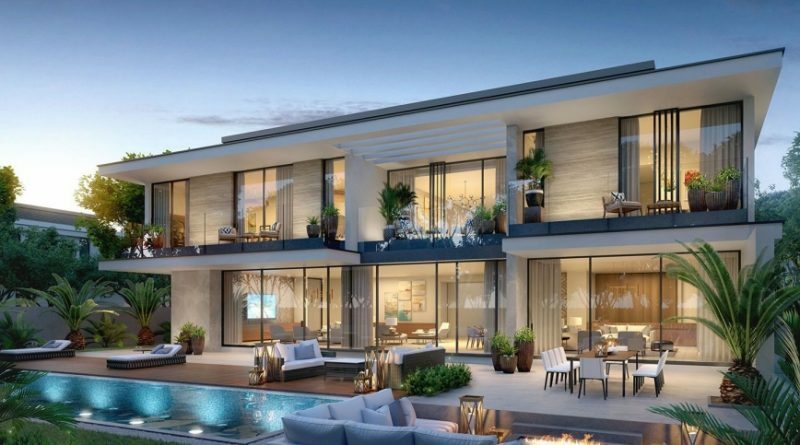 This luxury development will be the home to the Dubai Hills Golf Club. When completed, the golf course will encompass 1.2 million sq meters of meticulously manicured fairways. The property is set against the backdrop of Burj Khalifa and Downtown Dubai. In addition, Majestic Vistas will be near the Dubai Hills Mall, which will provide endless luxury shopping possibilities. Are you interested in learning more about Majestic Vistas? Please contact us today for additional information. Be sure to return soon to our popular luxury blog.